Latest Comment (June 7, 18:40 UT) : There are several active regions on the Sun just now. 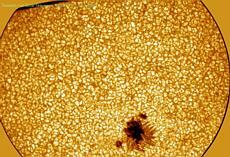 The image from the Swedish Solar Telescope (SST) on Tenerife (left) shows the so-called "granulation", cells of hot gas (hundreds of kilometres across) moving around near the visible "surface" of the Sun. The dark feature in the lower part of that image is a "sunspot", a region somewhat cooler than the surroundings. 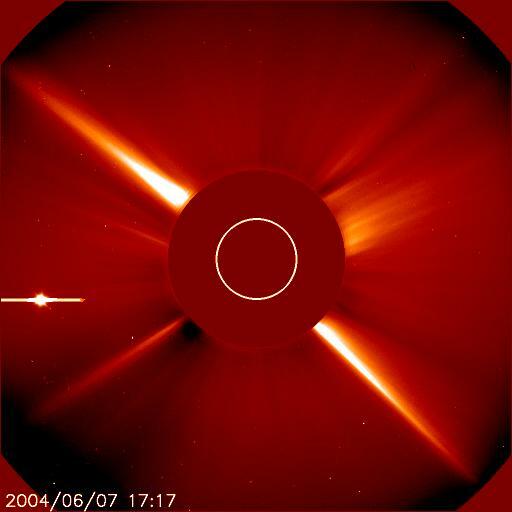 Venus is now visible in the C2-image from SOHO-LASCO (right), approaching the Sun from the left. A photo of the International Space Station (ISS) was captured as it moved in front of the Sun for a UK observer earlier today.